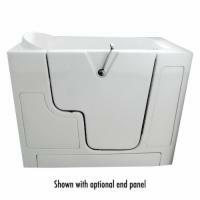 Don't let mobility problems stop you from enjoying a soothing whirlpool or comforting bath. Whether you need a lift to get in and out of the tub or can transfer from a wheelchair, the Sanctuary Deluxe Wheelchair Accessible Walk-In Tub makes it easier. With a door that opens outward to give you pivoting room to transfer, and room beneath the tub for the base of a lift, this walk-in bathtub lets people of all abilities enjoy a whirlpool bath. Standard features like your choice of water jets, a non-slip floor, an ADA-compliant seat height and grab bars make the Sanctuary Deluxe Wheelchair Accessible Walk-In Tub a safe, convenient choice.